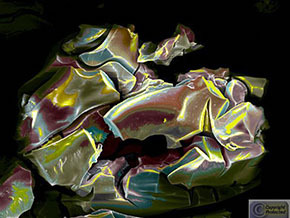 NanoArt International Online Exhibition I NanoArt International FestivalNanoArt is a complex artistic-scientific process that comprises three major components: 1. creation of the nanosculpture (sculpture at atomic and molecular levels, by manipulating atoms and molecules using chemical reactions and physical processes) or discovery of the nanolandscape (natural nanostructures, mostly biological); 2. visualization of the nanostructure (which is facilitated by the use of advanced microscopes) and image capture; 3. artistic interpretation of the scientific images using different artistic techniques in order to convert these images in pieces of artwork to be showcased for large audiences and to educate the public with creative images that are appealing and acceptable. NanoArt is not Microphotography. The depth and three dimensions achieved in NanoArt sets this process of electron imaging apart from Photography where images are created by photons (particles of light) rather than by electrons (electrically charged particles). The electrons penetrate deeper in the structure creating images with more depth, more natural 3D-look than the photographic images. NanoArt could be for the 21st Century what Photography was for the 20th Century. We live in a technological society, in a new Renaissance period, and there is no reason for Arts to stay away from Technology. NanoArt is the expression of the New Technological Revolution and reflects the transition from Science to Art using Technology. Scientists are exploring the nano world hoping to find a better future and there is evidence that Nanotechnology might be the answer. Like any new technology, Nanotechnology can have positive or negative effects on the environment and society. Artists should familiarize the general public with the nano universe, so people will focus on the positive effects and redirect the negative ones to benefit from them.